The Outdoor Research Seattle Sombrero has been tested in some of the heartiest downpours the world has to offer. The Seattle Sombreo is a rainy day classic with a shell that offers waterproof protection and a brushed lining that manages perspiration. 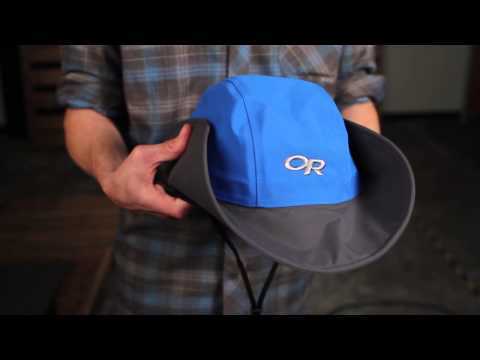 The shaped brim directs water away from your head when it's gushing. This is a great hat. I had one for years and I lost it, so I bought another. I love this hat! I bought mine around 1989 for use while skiing in Colorado. I liked to keep the brim velcro'd up to pull off the "cowboy skier" look. It worked out beautifully. It also works well here in Florida, for sun and rain. After all this time, it still looks great. It's just a cool and comfortable product. I really like this hat. With the adjustable strap inside the brim, I was able to make the hat fit perfectly. I do wish the brim was a little more stiff, but otherwise a very comfortable hat. I just completed a weekend Pacific Northwest backpacking trip with my daughter. It rained so hard, we cut a day off our trip. My Seattle Sombrero our performed every piece of gear that I took into the backcountry. I talked my wife into buying one and I'm sure she will love hers too. This is a great hat! The sombrero rain hat is great. I use it kayak fishing. It offers great sun and rain protection. Also provides warmth on a cool day. My wife & I have 5 Sombreros all different colors. We use them all winter in New England. Perfect for wet cool days. I use it hiking and kayaking, also like that it keeps the sun off my neck a bit.